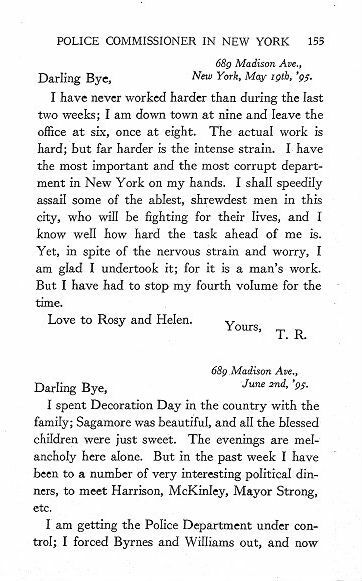 In addition to books, TR wrote letters to his family. These letters, one of many written to his older sister Anna, whom he called Bye, talks about his first days as Police Commissioner of New York City. 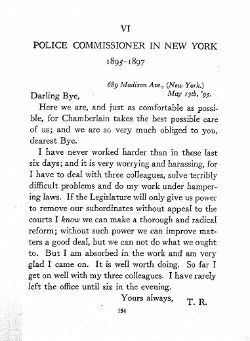 Here we are, and just as comfortable as possible, for Chamberlain takes the best possible care of us; and we are so very much obliged to you, dearest Bye. I have never worked harder than in these last six days; and it is very worrying and harassing, for I have to deal with three colleagues, solve terribly difficult problems and do my work under hampering laws. If the Legislature will only give us power to remove our subordinates without appeal to the courts I know we can make a thorough and radical reform; without such power we can improve matters a good deal, but we can not do what we ought to. But I am absorbed in the work and am very glad I came on. It is well worth doing. So far I get on well with my three colleagues. I have rarely left the office until six in the evening. New York, May 19th, '95. I have never worked harder than during the last two weeks; I am down town at nine and leave the office at six, once at eight. The actual work is hard; but far harder is the intense strain. I have the most important and the most corrupt department in New York on my hands. I shall speedily assail some of the ablest, shrewdest men in this city, who will be fighting for their lives, and I know well how hard the task ahead of me is. Yet, in spite of the nervous strain and worry, I am glad I undertook it; for it is a man's work. But I have had to stop my fourth volume for the time. Love to Rosy and Helen. 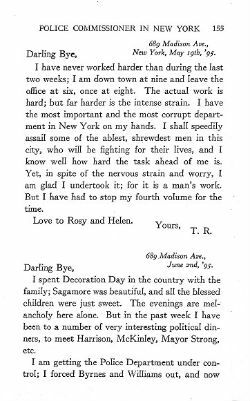 I spent Decoration Day in the country with the family; Sagamore was beautiful, and all the blessed children were just sweet. The evenings are melancholy here alone. But in the past week I have been to a number of very interesting political dinners, to meet Harrison, McKinley, Mayor Strong, etc.